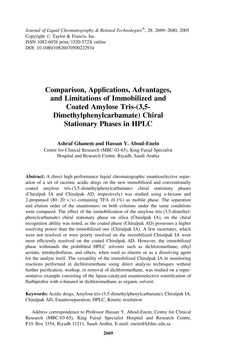 A direct high performance liquid chromatographic enantioselective separation of a set of racemic acidic drugs on the new immobilized and conventionally coated amylose tris-(3,5-dimethylphenylcarbamate) chiral stationary phases (Chiralpak IA and Chiralpak AD, respectively) was studied using n-hexane and 2-propanaol (80:20 v/v) containing TFA (0.1%) as mobile phase. The separation and elution order of the enantiomers on both columns under the same conditions were compared. The effect of the immobilization of the amylose tris-(3,5-dimethylphenylcarbamate) chiral stationary phase on silica (Chiralpak IA), on the chiral recognition ability was noted, as the coated phase (Chiralpak AD) possesses a higher resolving power than the immobilized one (Chiralpak IA). A few racemates, which were not resolved or were poorly resolved on the immobilized Chiralpak IA were most efficiently resolved on the coated Chiralpak AD. However, the immobilized phase withstands the prohibited HPLC solvents such as dichloromethane, ethyl acetate, tetrahydrofuran, and others, when used as eluents or as a dissolving agent for the analyte itself. The versatility of the immobilized Chiralpak IA in monitoring reactions performed in dichloromethane using direct analysis techniques without further purification, workup, or removal of dichloromethane, was studied on a representative example consisting of the lipase-catalyzed enantioselective esterification of flurbiprofen with n-butanol in dichloromethane as organic solvent.